Kagin’s Inc has put together over 500 lots to present for live bidding over three sessions on September 15th and 18th, 2017. 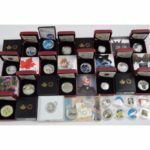 As part of the Santa Clara Coin Expo, they will be presenting one of the feature auctions of the weekend filled with highly collectible and valuable pieces. 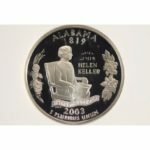 There are great selections of US Coins and Numismatics from around the world. 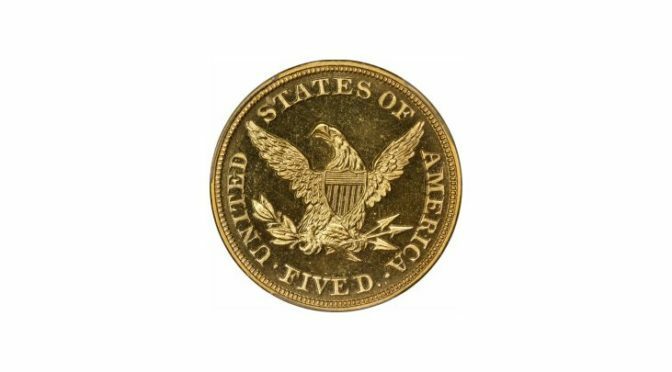 The present 1860 $5 is proof positive that mintage figures can be deceptive. According to official records, 62 half eagles were struck in this format during the year; yet, PCGS and NGC population reports record a total of only six examples of the issue! David Akers surmised that most examples struck in 1860 never left the Mint, and it is nearly impossible to imagine any other explanation for such a low survivorship rate. The Mint began keeping records of proof mintages in 1859, and a careful analysis of the available data suggests that only the No Motto proof $5s with similar levels of attrition were those that were struck in 1859 and 1861. By 1862, it seems that Mint officials had a better handle on collector demand, and the mintage figure drops to 35 pieces, a third of which are known today. The present specimen is one of only two examples in a PCGS holder today, and is the single finest 1860 proof half eagle graded by either service! It is difficult to follow an opening like that, but this beautiful half eagle performs magnificently. The well-struck devices are fully frosted and seemingly float in ponds of molten, reflective peach-gold; a trace of lightness is seen at the eagle’s talons, otherwise crisp is the word for the design elements. 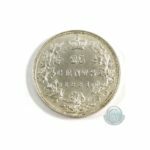 A few scattered lint marks and a tiny natural planchet flaw – features found on virtually every 1860 half eagle – can be found on the obverse, while the stunning reverse escapes all but some trivial hairlines. 2 – The Ten Eyck/Clapp/Eliasberg/Trompeter Specimen. 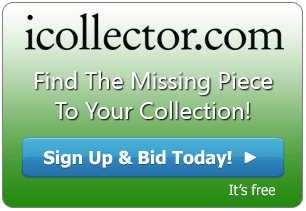 Ex B. Max Mehl’s sale of the Ten Eyck Collection, 1922; John H. Clapp Collection; Louis E. Eliasberg, Sr.; Bowers and Ruddy’s sale of The United States Gold Coin Collection (10/1982); Heritage Auction’s private sale of the Ed Trompeter Collection, (1999). Stacks (8/2017). NGC PF65 CAM. 4 – The Farouk/Norweb Specimen – Sotheby’s sale of the Palace Collections of Egypt (2/1954), Bowers & Merena’s sale of The Norweb Collection, Part 1 (10/87). Presumably either NGC PF64CAM or PCGS PR64CAM. 6 – The Amon Carter Specimen. Stack’s sale of the Amon Carter Collection (1/1984). Presumably either NGC PF64CAM or PCGS PR64CAM. 7 – The Smithsonian Institution Specimen. Ex United States Mint; National Numismatic Collection in the Smithsonian Institution. Permanently impounded and, thus, unobtainable for private ownership. 8 – The Lilly/Smithsonian Institution Specimen. Ex Eli Lilly; National Numismatic Collection in the Smithsonian Institution. Permanently impounded and, thus, unobtainable for private ownership. 9 – The ANS Specimen. Ex J. Pierpont Morgan; American Numismatic Society. Permanently impounded and, thus, unobtainable for private ownership. Only a few great collections have contained an 1860 proof half eagle of ANY quality, much less the single finest known specimen. As you figure your bid, keep in mind that this is the first public opportunity to own a PCGS-graded example of this rarity since the present example was offered as a PCGS PR65 in November of 2000. Don’t miss this rare opportunity! PCGS Population: 1; none finer within any designation. NGC has recognized five Proofs of the date for comparison purposes, all of those called “CAM” with the finest designated as Proof-66 CAM. Lively olive-gold with deeply impressed figures, this squared finger-like ingot weighs more than a troy pound of gold. Impressed with BLAKE & Co / ASSAYERS / SACRAMENTO on the face, and with other pertinent information on other sides. Assayer’s test chip cut from one corner. Photographed on page 108 in the monumental A California Gold Rush History by Q. David Bowers with heavy emphasis on the S.S. Central America treasure, this ingot is one of many pour styles and sizes listed for the firm. The Bowers reference also features a newspaper ad, on the same page, for the Blake & Co. assaying firm which reads: “ASSAY OFFICE. Blake & Co., No. 52 J Street, between Second and Third, SACRAMENTO. GOLD AND ORES OF EVERY DESCRIPTION Melted and Assayed, and returned made within twenty-four hours, in bars or coin.” One of only 34 ingots recovered from the Central America representing this assaying firm. The entire catalog is online for browsing with full photos and descriptions. Kagin’s is very eager to answer all questions through email or telephone and look forward to providing exceptional service while offering this exceptional sale.